This is a brief and simple understanding of what a circuit is and the usage of it. We all know about electricity. It is the flow electrons. Hence the word electricity is derived from the word electrons. A battery itself doesn’t work, if you hold it up in air, there would be no passage of electric current. Hence you need a circuit. In Simple terms an electronic circuit is a closed pathway for electrons to flow. The Electric Current in a circuit flows from positive to negative while electrons flow from negative to positive. So when the switch is on the path is complete and electricity passes through enabling the bulb to light up, while when the switch is not on, there is a break in the flow of electricity and the bulb does not light up. You would find circuits in every electrical device you use - from your switch board, television, refrigerator to your laptop. You must have heard two terms – Electrical and Electronic. First let’s understand the difference between these two terms. While electrical is the basis of everything, electronic is a subset of electrical. 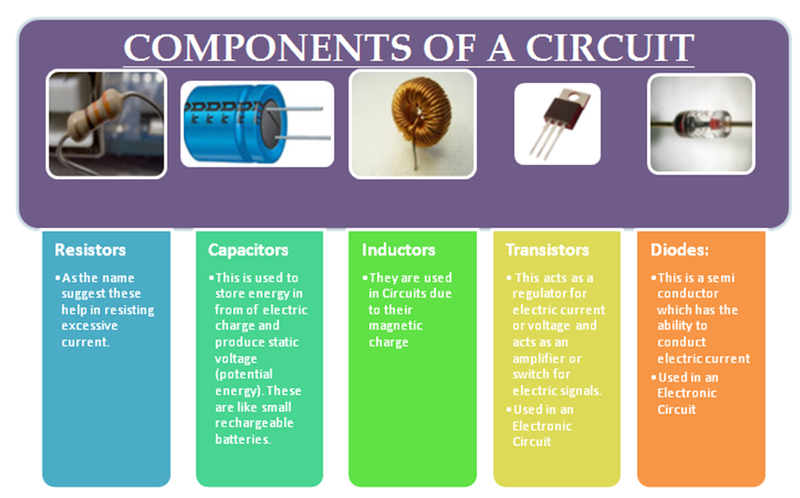 An electrical circuit deals with just the flow of electrons and has components like resistors, inductors and capacitors and uses Alternating Current Source; while electronic circuit deals with the transformation of current and controlling the motion of the electrons and uses Direct Current Source. 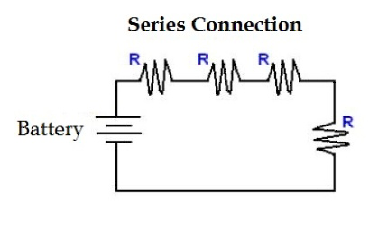 An electrical circuit is termed as Passive because it doesn’t have any such component that reacts to the current/voltage that passes through them and electronic circuit is called active because of the additional components like diode or a transformer that react to the current/voltage that passes through. The components of a circuit are arranged in many ways, two of the simplest are – Series and Parallel. 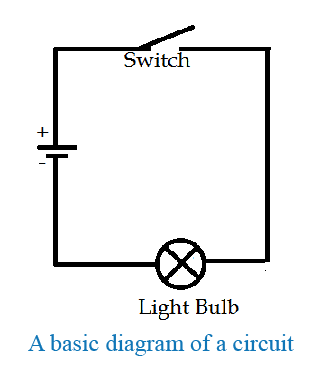 If the components of the circuit are connected in one single path is it termed as series. The same current would flow through all the components while the voltage would differ from one component to another. For example you have lit three lamps in series to the same power source, the first one would receive more voltage than the last. 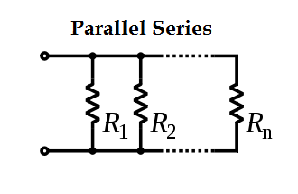 If the components are connected in a parallel format they would be termed to be a parallel series. In this sort of a connection all the components would receive the same voltage, while the current would be divided amongst the components. An electric current is defined as free flow of electrons and the motivating force behind that free flow of electrons is called Voltage. Voltage is the measurement of potential energy that would move the electrons between two points. Voltage is the push that the electrons require to move within a circuit. Voltage is measured by Volt and Current is measured by Ampere. Ohm’s law states that the current through a conductor between two points is directly proportional to the potential difference across those two points. It means that more the resistance lesser current would flow. I=V/R This would apply to any component of a circuit. For example conductors would increase the current flow and the inductors would decrease it. These are commonly termed as IC’s. They are usually in form of chips and microchips. This is a set of multiple electronic circuits on a small semiconductor device (normally silicon). With the advancement of technology, these IC’s prove to be extremely beneficial. They are present in any electronic device you can name. From computers, mobiles to other digital appliances you have multiple IC’s present in them. Their main components are a combination of Diodes, transistors and microprocessors. The microprocessors provide memory to the device. With the help of the microprocessor the electronic devices can perform logical or protocol applications. Physics has always been an integral part of our lives and curriculum. From students who study in school to engineering colleges; everyone is quite familiar with the concepts of physics. Understanding Circuit is one of the main parts. Even if you are not physics major or have hardly paid attention to this subject in your school years, in layman terms you would still make sense of a circuit. Like you need the organs of a human body makes it work, in the same way a circuit makes any electrical or an electronic device work. It provides a path way for the electric current to reach your light, fans and all the other electrical utilities. From the smallest digital device to the biggest electrical item you own, each and every system has a circuit in built in them. You must have used the term short circuit a gazillion times at your home. That is nothing but a bad connection between the two points of an electric circuit that has two different voltages that result in excessive current flow and causes circuit damage. Understanding a circuit is deeply beneficial for anyone. From house hold usage to hi tech inventions; a circuit is base for any technological advancement. 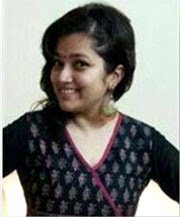 Author Bio: Trisha is a professional writer and adviser on education and career. She is an ardent reader, a traveler and a passionate photographer. She wants to explore the world and write about whatever comes across her way.